Last night's temperature was -11 and today's high is -3. Still the rink is rough (sunny all day). About ten skaters at 3.30 pm, three rink staff plus the zamboni driver. 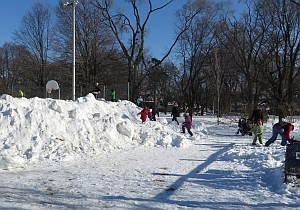 Now that the snow is gone the park looks rough. The new quonset zamboni garage was never used this winter because the fuel line was not in by the time the ground froze. The digger hole is still there, more or less covered by an upside down picnic table that's slowly bio-degrading in the dirt. 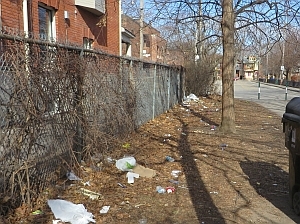 The public thoroughfare to the north of the rink is full of trash. There were lots of underemployed rink staff in March, that could have cleaned it. But trash is a different department, not due to resume work until April. Silos. The rink finally closed for the season at 9 pm. It was cloudy with showers this morning, so even though it went to 6 celsius, the ice held. Then the sun came out in the afternoon. But fewer than 10 people came all day, although the park had many people in it. The rink is so quiet compared to winter -- the main sound is the compressors, labouring along. 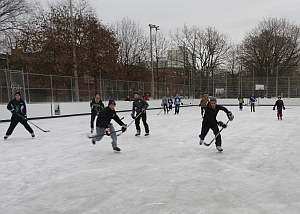 The temperature hovered between -2 and +2, with occasional clouds in the morning, so most rinks didn't have to be shut down until mid-afternoon. 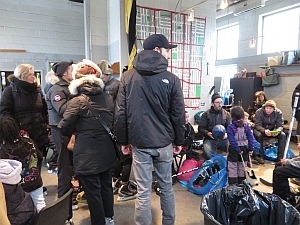 At Dufferin Rink, the six kids playing shinny started to have trouble moving the puck around lunchtime, so they went across to the mall and bought a beachball. They brought it back and put their skates back on and tried playing "ice soccer," which amused them for a bit longer. But the ice deteriorated more, and eventually there were only three kids left, trying to pleasure-skate on the shinny side, since the pleasure-skating side had to close. Sunny. At 12.30 it was 2 celsius, ice holding well, 2 skaters. At 6 pm the rink is listed as open, with 3 new skaters trying not to fall on the pleasure-skating side. 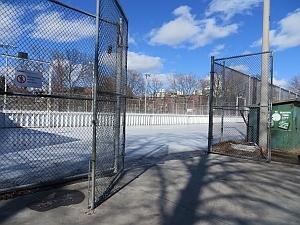 The gate to the hockey side is open but no skater is foolish enough to try it. There are 4 staff inside the building. Temperature is 0 celsius. 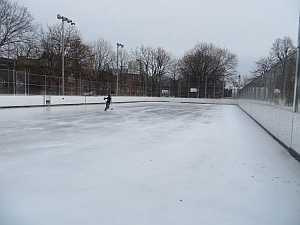 311 lists about half the city's rinks as closed, but not this one. The zamboni operator came by to look but didn't say anything. 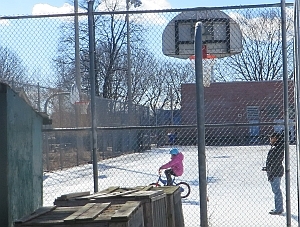 March 17: at 3 pm 311 lists Dufferin Rink as "open"
Mainly cloudy with sometimes hazy sun, 1 celsius in the morning, 7 by 2 pm. Ice wet in places but not bad. At 1.30 there were one hockey player and 8 pleasure skaters. Cloudy in the morning, plus 1, so the ice held, but the sun came out at about 1 pm and in the rink was closed at 3 pm (plus 4). Shinny hockey side closed at 1 pm on March 11, closed at 3 pm on March 12. 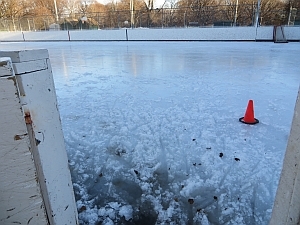 The ice is having trouble, and so is the rink house. 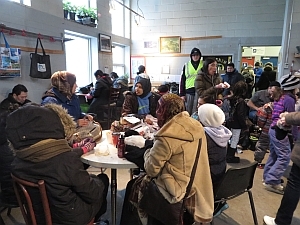 Since Feb.23, when Wallace and Campbell Rinks closed, some of the most troublesome kids from there have returned to hang out at Dufferin. Mostly but not only guys. They bully each other, make a big foul-mouthed racket, and even steal from other youth. Staff are unable to fix the problem, although they make an effort. 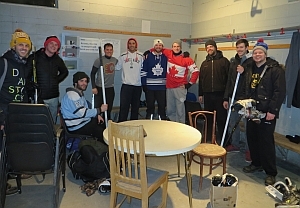 This group of local boys (now all in their early thirties -- many of them worked at the rink when they were teenagers) came to play shinny despite the cold. They lasted a full hour and claimed it was invigorating. 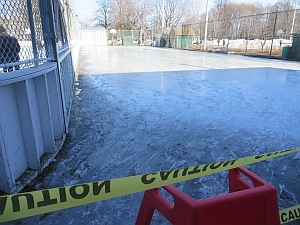 First thing: The foreperson's order, cancelling the fifteen-year after-hours open shinny time, was rescinded by the recreation on-call supervisor the very next evening. But still there were only four shinny players who came each of the next two nights (when there used to be at least 20!) -- I guess the word got around that a new rule was in play. 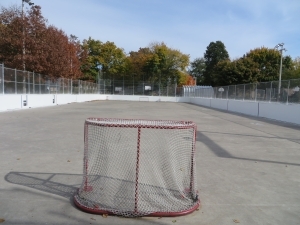 We wondered if this would be the next sour grapes action by city staff -- once again reducing rink use, as they have managed to do at many rinks formerly much used by youth, by forcing them to wear helmets for non-contact (shinny) hockey). 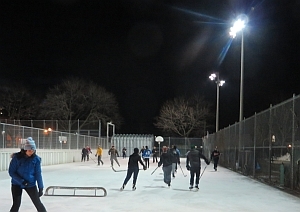 But tonight there were at least 30 shinny players, back again. And incidentally, about 4 were wearing helmets and the rest were not -- but they were all playing agreeably together, in shifts. Second thing: A use has been found for the Quonset garage. It's used to store the flying-squad zamboni at night-time. Good that it has some kind of function, since the Dufferin Rink zamboni continues to be safe and comfortable in the original garage. 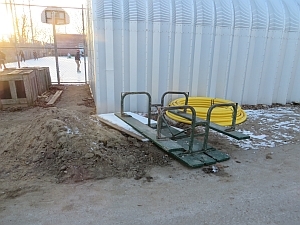 After the brief attempt on January 15 to dig a trench for the gas line in the hard, frozen ground, between the field house and the new garage, the job stalled. The gas hoses are still lying there, but the yellow danger tape is gone except for a few shreds. 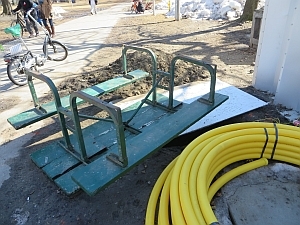 A park picnic table has been used to cover part of the digger hole -- too bad, lying upside down for weeks or months on the freezing/thawing ground will be the end of that table. Tonight the ice maintenance foreperson Phil Rock came to the rink and ordered the rink guards to remove the shinny nets from the rink (it was the after-hours rink time, when there's unsupervised skating). This is the same foreperson who earlier put in a work order to build a barrier that could keep the fingers of skaters safe from passing zambonis (see the Dec.6 diary entry). That work order was later cancelled. This time he said that even though the second rink pad is unsupervised after the building closes and the staff are cleaning inside, there is to be no shinny hockey on that rink pad, because there has been "a complaint." The young staff were convinced, even though he is not their supervisor. So all the shinny hockey players went home, and four pleasure-skaters -- who had not been able to fit in their skating during the 12 hours, 9 am to 9 pm, that the rink is off limits for shinny hockey -- were able to skate undisturbed after hours. The Quonset Garage is still empty. Today a backhoe appeared and began digging a hole beside the field house. The temperature was minus 16 celsius, so that mustn't have been fun. Also the Quonset garage has danger tape around it and a big roll of yellow pipes inside that enclosure. After lunch the backhoe left and didn't come back. There was another crew at the garage to grind down the top of the door -- maybe it's sticking. Over the month, there have been various visits to fix little problems. The amount of staff and contractor hours that have been charged to this project must be considerable. What's missing is a reason for the building, since it has evidently not been approved for zamboni storage. The rink was very crowded, but people seemed to be in a fine mood and there were many "Happy New Year!" greetings, between acquaintances and also between strangers. 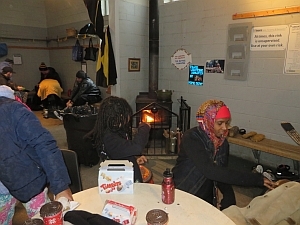 It was a cold day, with a bitter wind, so we made a fire in the woodstove inside the clubhouse. A little girl watched with rapt attention as we lit the wood. She asked, somewhat doubtfully, "is that real fire?" We said, yes, it's not a channel on a TV. Shinny hockey players came over to the fire to warm their mitts on the mitten rack. Holiday Hours: open every day including Christmas Day, Boxing Day, and New Year's Day. Closing at 6 on Christmas Eve and Christmas Day. Open until 12.30 a.m. on New Year's Eve. On December 24 and 25, the rink opens at 9 am and closes at 6 pm. 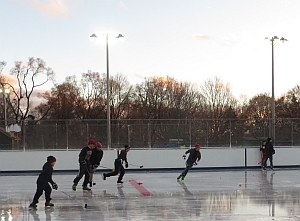 On both of those days, all-ages shinny hockey goes from 9 am to noon and again from 3 to 6pm. 12-and-under shinny hockey is moved up to noon until 1.45 (a chance to try out any skating presents that may be under the tree), and 13-17 shinny is from 1.45 to 3. On New Year’s Eve, the schedule is like Saturdays except that from 9 to midnight it’s neighbourhood shinny on the hockey pad and pleasure-skating on the other side. Skate rentals will be open until the countdown and the snack bar will be going as well. On New Year’s Day, the Saturday schedule will again be in effect (even though January 1 is a Thursday). 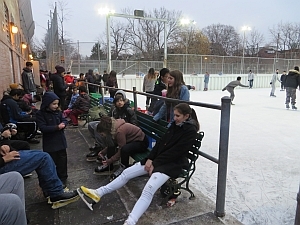 Note that most other city rinks will be open for skating on the three statutory holidays but will have no change room/washroom access – hard to believe but true. 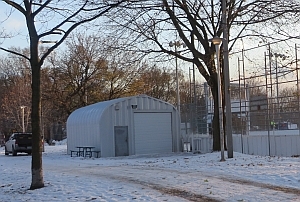 The new Quonset Hut garage is still not in use. 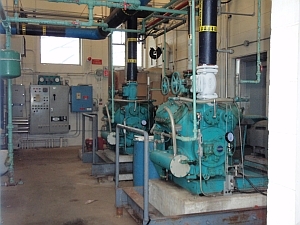 The problem appears to be that the gas line certification needed for the zamboni gas supply is not yet available from the provincial authorities. So the zamboni continues to stand in the original garage that's been in use for 21 years. 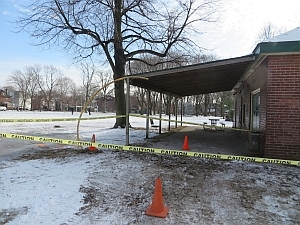 Someone in authority has put in a safety-related work order for wire mesh to be welded to the railing along the end of the pleasure-skating rink pad, and for two swing barriers to be put up at the two open spots where skaters can get on the ice. None of the recreation program staff were consulted, so whoever put in the order is a silo-ed mystery. The reasoning, apparently, is that during the ten seconds when the Zamboni passes close to the railing to clean that edge of the ice, there is a risk that kids might stick their hands through the railing and try to touch the Zamboni, and injure their hands or their fingers. There has never been such an injury – but what if? The solution proposed here makes a new problem. A tight-weave wire mesh fence will be ugly, and swing barriers may be not only ungainly but also cumbersome and wobbly. 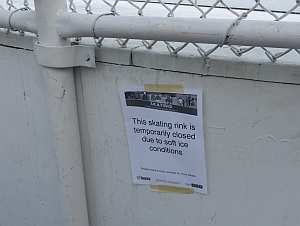 The current metal railing is much used by beginning skaters when they’re setting out – whereas holding on to a shaky swing barrier railing would provide unreliable support. 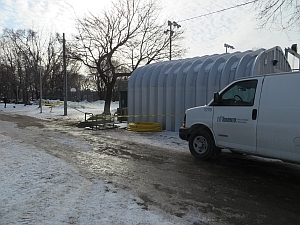 Beyond that, what if skaters at Dufferin Rink get so used to this bubble-wrap protection that they no longer feel secure skating at the many other city-owned rinks that have no Zamboni barrier at all – the rink at City Hall, for example, or Wallace or Ryerson rinks, or the skating trails at Colonel Sam Smith and Rennie Rink in the west, or at Greenwood and Dieppe rinks in the east? Should skating trails also have wire mesh fences and swing barriers all along, so that Zambonis won’t hurt the skaters? What about the danger of kids hurting their hands trying to touch the passing buses at the Dufferin bus stop? Should there be swing barriers down there too, which could be closed until the bus comes to a full stop? Plain silly, this kind of risk management. Hopefully someone will cancel the plan. I have had discussions with Recreation Staff and our concerns have been addressed. I requested earlier this morning that the work order be cancelled. 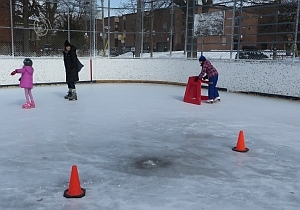 It was a day off school for kids, and rink seemed to have hundreds of them at all points of the day. A very friendly scene. In the evening, the zamboni came on the ice to clean the shinny side, and on the pleasure-skating side, kids started to play hockey even before the zamboni had finished with the entire rink (NOT allowed). Under the new central administration, there are times when quite inexperienced, quite young staff are put in charge. The new co-ordinator tonight didn't know about the "no-shinny-on-the-pleasure-skating-side-after-the-rink-house-closes-until-the-zamboni-is-gone" rule. One of the teenager skaters said "but the kids knew. There was no excuse for that. Their problem is they just don't listen." Funny, moralistic. But the kids who were out there with sticks stopped, and they looked a bit embarrassed. It seems like the culture of the rink youth, negotiated painstakingly over a couple of decades, is more solid than we expected, even with the fuzziness of the new management. The insulation trucks have returned, apparently with an enlarged scope of work from the original plans. After they were finished blowing in the new insulation, they set up a generator to run all night, presumably to dry the insulation. Odd -- why have a generator if there's power in the new garage? Technical staff found a problem with the motor of the rink's condenser. Inside of 24 hours, they ordered a new condenser motor, brought in a telescoping crane, removed the broken motor (very large and heavy) with the crane, and installed a new motor. There was no interruption in the skating schedule, and in fact very few rink users or program staff even noticed the work was going on. Now that's some skill! 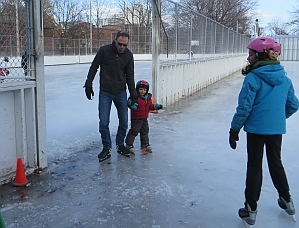 Compare with Queensway Rink in Etobicoke, with a damaged compressor motor that won't be fixed until three weeks past the scheduled opening date -- and the rink is out of service until Dec.22. 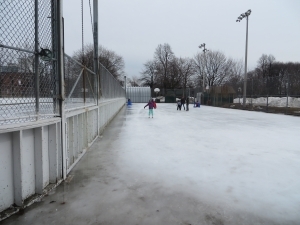 How did Dufferin Rink get lucky and Queensway not? The ice is more or less back to normal. Lots of skaters. The zamboni is still in the original garage. Carpenters are working in the new garage, putting up aluminum drywall-type sheets in the inside. They said they had to wait until now so that the electrical inspectors could okay the wiring. There are still other issues, and there's a rumour that the new garage won't be used until after Christmas. 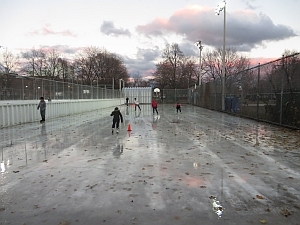 The rink has water on it -- a high of 18 today, some rain but very little sun. In the late afternoon, the forecast roaring winds came up -- the park was very noisy, the tree branches were bending over. Up to 90 Km per hour. Eventually (at 7 p.m.) the rink staff got permission for the rink to close for the night. There were leaves and small branches all over the ice, blown in by the high winds. The zamboni staff used the squeegee to get some of them off, but many more leaves will now freeze into the ice. This morning the carpenters were putting up indoor aluminum boards in the new zamboni garage. They could do this because the electrical inspector had signed off on the new wiring. No word yet on when the propane inspector will come, so the zamboni is still using the older garage. Pleasure-skating only in the daytime (Sunday) but in the evening there are shinny players. Big attendance. 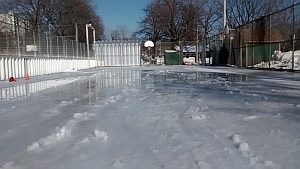 I ask -- how did you all know the rink would be open? They say -- on the first days, everybody tells each other, everybody comes out. Afterwards one shinny player is holding an ice pack to his elbow -- he crashed into somebody and took a fall. His friends tell him he ought to have been wearing a helmet -- on his elbow. He grins. Almost no one is wearing a helmet -- more people have shin pads, some from soccer. In the summer, a woman donated some old church benches for the inside of the rink house, for skaters to sit while they put on their skates. Lots of comments -- how did we get Mennonite church benches in here? Someone says, it's the right thing, we're here in the church of Canadian hockey. Yes, yes, from the other players. The rink is open, and there are quite a few shinny players out -- only one with a helmet. A program staff person is threading broken laces into the loaner skates, knotting bits of old laces. She doesn't know if there are any new laces. 12 noon: the zamboni has developed a hydraulic fluid leak (it's red, looks a bit like blood) and so there can be no ice maintenance. 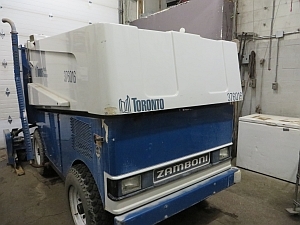 Maintenance staff say they'll try to find a replacement zamboni. 3 p.m. some young teens get into a fight, with one of them giving another one a nosebleed by hitting him with a hockey stick. They won't listen to the staff to settle down, so the police are called. One of the officers talks to the kids about anger management. 3.30 pm: a different zamboni is delivered, but it only manages to scrape the hockey side. By the time it gets on the pleasure-skating side, it also breaks down. Late afternoon: a second replacement zamboni is delivered. It turns out that the daytime zamboni driver has to work the evening shift too -- not enough zamboni drivers are available. 7 pm: a zamboni supervisor arrives and insists that the pleasure-skating side must be cleared of skaters and must get intensive remediation right away "or we're gonna lose the ice." To experienced rink users the ice just looks a bit rough -- no surprise given the ice-making problems from last week. 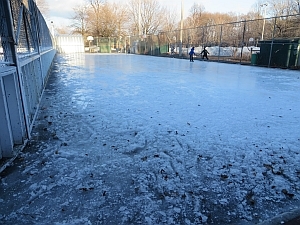 Program staff suggest a shorter resurfacing and then a more thorough going-over before the rink opens in the morning. 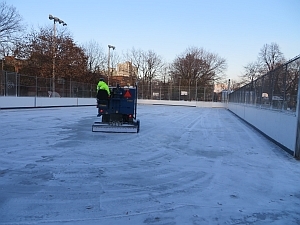 But the supervisor does as he wishes, and for 45 minutes no one can skate there, while the rink is scraped and flooded (with additional moisture from the rain that has started). Many people give up and go home. Even so, even as the rain falls, more people come in the doors to skate -- first day. 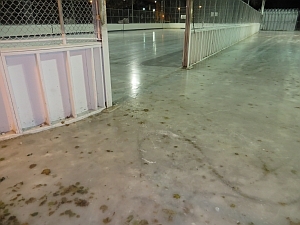 10.30 p.m.: The rink is locked, the ice smooth on top and looking rough underneath. But ready to go. 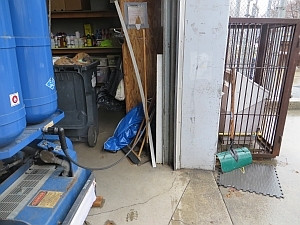 The zamboni is not in its new garage, but in its former one -- apparently the fuel supply in the new rink has not been certified, so it can't be used yet. In the afternoon, two staff came to remove yesterday's snow with the zamboni. Then they ran the zamboni up and down with the blade up, sprinkling to deposit more water. The snow is still embedded in the ice underneath, the leaves too, but for now the fix may work. 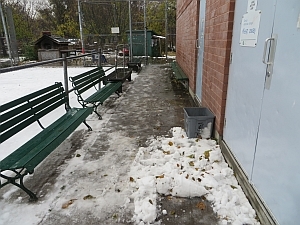 The same staff chipped away at the ice on the walkway and laid down the mats. 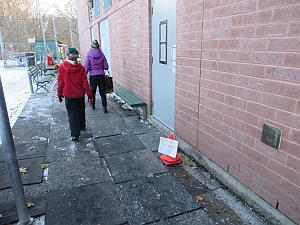 Program staff put out trip hazard signs because the walkway is very uneven. But that will fix itself in a few days when the thaw begins. All this is happening in the context of Buffalo and surrounding towns being buried in 6 feet of snow, more coming. In relation to that, the cold weather here seems benign. And lots of excited kids are visiting the rink, wondering -- when? when? The ice continues to look bad. There was snow in the afternoon and evening (about 5 cm), so no further attempts at ice-making. Ice maintenance staff have not put out any rubber mats -- they seem to be confused about whose job it is. Program staff can't put out the mats because they are locked up by ice maintenance staff. Silos. As forecast by Environment Canada, the temperature dropped to minus 9 overnight and stayed very cold all day. 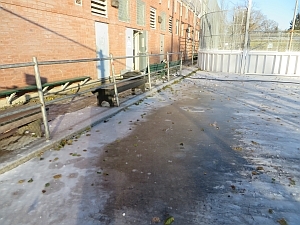 There were winds gusting to 70 K. Ice maintenance staff worked parts of two shifts to hose the ice, but it looked very rough, with lumps of ice, snow under the ice, and many leaves frozen right in. The test patch looked surprisingly solid, no cracking or shelling, but still it was too thick. 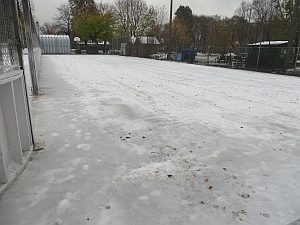 The compressors were turned on two days ago, so the slushy snow that fell since last night has frozen right onto the slab. So did the leaves. In the morning a tractor ploughed the top layer of snow off, but you would hardly know it -- there's an inch of snow crust all over the rink. Nobody returned to hose the snow off with hot water (which might have been worth trying, since the temperature went over 0 this afternoon). What will happen next, with more snow coming, and much colder temperatures tonight? The recreation program staff have the impression that all the ice maintenance staff are at their yearly refresher training, every year the same. Maybe that's why they couldn't come and try to fix the ice. Later on, volunteers hosed a test patch of 6 x 20 feet with hot water. The temperature was at 0 and the snow melted in five minutes. But it was hard to get the water off -- a zamboni might have been a big help here. The compressors have been turned on to start cooling down the slab, although it's been barely above freezing since last Tuesday and the rink has had patches of ice on it most mornings already. The carpenters have come and replaced cracked boards, the painters have put on a new coat of white, the leaves have been blown off (for now -- there are lots more leaves left to fall off the trees). The rink house is more or less ready indoors, the skates are on the shelves (with many sizes missing, sadly, since the city stopped replacing most skates). There's a new zamboni garage, looks a bit like an airplane hangar. It was built in the fall, and has plumbing a well as electricity.